If you want to be a water pokemon master, you definitely need Vaporeon in your team! 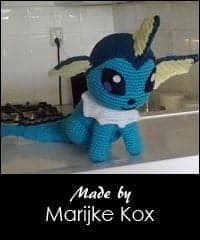 Vaporeon is one of the eeveelutions which you can obtain by using the water stone. This pokemon loves to swim and has the ability to melt into water and dissapear. Thanks to its strenght Vaporeon is often used to attack Gyms in Pokemon Go. Keep sending your pictures to contact@sabrinasomers.com! Oh my Goodness! 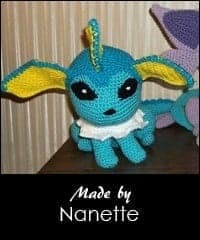 Each time you make another Pokemon I just Love it! You are so Very talented! So much detail! You are amazing! Your patterns and the end results are stunning. My grandchildren love their presents of so many Pokemon figures. I added the pattern to your account. This is such a cute one. I’ve never seen him before. This is so cute! My boys will love these! Love ur Pokemon! They r so cute!